Errata in the third paragraph (”steepening” -> ”flattening”) corrected in 04/08. Yield curve inversion has spooked the markets. In all honesty, it should not have come as a surprise. After the Federal Reserve pivoted early January and utterly capitulated in early March, everyone should have deduced that something was seriously wrong with the US economy. Bond markets have already signaled this for a while. We have warned about the coming recession and crisis for two years. In March 2017, we published our first-ever global crash warning. Then we gave a 70% probability of the market crashing during the next 12 months. We also emphasized, strongly, that central banks and governments have plenty of ammunition to keep the cycle going. We also warned their large role in the current expansion makes forecasting the onset of a recession exceptionally difficult. On these, we were 100% correct. In December, we forecasted that the global recession will start in Q4 2019 (Q1 2020 in the US). In early March, we reiterated that call. With the ever-flattening yield curve, it appears that recession may even arrive earlier. Here, we briefly explain why. In the academic literature, the inversion of the 10-year – 3-month is a better (more powerful) predictor of impending recession than, e.g. the 10-year – 1-year difference. Since 1968, recession has always started within the next 9-17 months after inversion of the 10y-3mo. Moreover, the Fed has concentrated its QE-operations to the mid-range (1- to 5-year maturities), which has fudged that part of the curve. The Fed does not hold any T-bills (US short-term debt obligations) and it has been doing very little buying in the long end (10- to 30-year maturities) of the curve, with obvious reasons (risk of inversion). This makes the very short-/long-end comparisons, like the 10y-3mo difference, basically the only reliable part of the curve. So, as the 10y-3mo difference is likely to reflect information from the economy, and not from CB buying/selling, what does it reflect this time around? As we have warned numerous times (see e.g. this, this, this and this), we have not been living in a normal business cycle. This is because of the constant flood of stimulus, most notably from the major central banks and China. While the asset markets have been supported by central banks, the world economy has been run by China. In 2009, China started a cycle of fiscal and monetary stimulus the scale of which has never been seen before. This is clearly visible from the diverging trajectories of real GDP and debt (Figure 1). China has become so indebted that continuing such massive stimulus programs would eventually crash its economy. This is something that the ruling communist party is most likely determined to avoid. 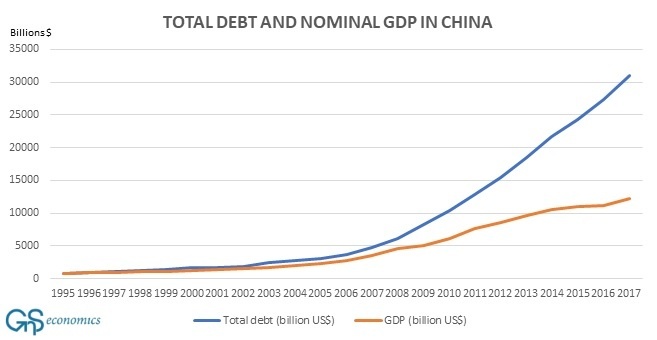 Also, because the effect of stimulus wanes over time, which is seen from falling productivity in China since approximately 2011, there comes a point where continuing it just adds debt (and risks) without spurring the economy. We think that China has either reached this point or is at least in its close proximity. Therefore, China is unlikely to come to the rescue this time around. The Fed rate-rising cycle is over, the global economy is slowing and its driver (China) is likely to be maxed-out. These are all likely contributing to the new urgency felt among bond investors: lower growth and inflation, which is reflected in the yield curve. According to recent academic research, beliefs are crucial in determining the turning points in the business cycle. When some piece of news, such as signals of approaching recession, spooks investors and households, they start to restrict consumption and investments and the cycle turns. In this process, real economic and financial factors, naturally, matter. The unfortunate fact is that the global economy never really recovered from the last steep downturn. As mentioned above, the expansion has been achieved by stimulus, with the latest iteration the tax cuts enacted by the Trump Administration. The growth in the US has been achieved principally through ballooning corporate and government debt. When financial conditions start to tighten, due to, for example, bank and capital market losses from a slowing global economy, they will make it harder for corporations and households to roll-over debt. They start to cut back their spending and the cycle turns. With high levels of debt, like now, this occurs even after only relatively modest tightening. This is already visible in the US credit cycle. Since 1976, the annual impulse of bank credit has never fallen for two consecutive years without a recession. 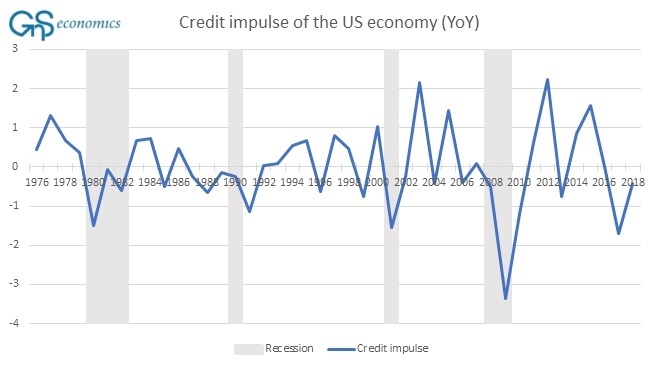 In 2018, the credit impulse recovered, somewhat, but still fell for the second year in a row (see Figure 2) despite very large fiscal stimulus. The inverted yield curve and credit impulse signal that onset of the recession is close. The only thing missing is for it to start to influence perceptions which may occur, basically, at any time. This is what happened, for example, in 1929. As the capitulation of the Fed during the first months of the year showed, central bankers acknowledge the asset bubble they have created and fear its demise. Nothing would dampen the spirits of households and investors like a bear market or an asset market crash. This is what central bankers all over the world wish to avoid, because if it happens, they have no reasonable means to stimulate. In addition, two major risks threaten to make the recession exceptionally deep (a depression). Many seem not to recognize that corporate debt and leverage pose a much more dire threat to the economy than, for instance, household debt. When companies start to fail, losses accrue to banks, debt holders, financial markets, households, government and other corporations. All sectors of the economy will be hit. The expansion is also standing on clay feet. Continuous stimulus has ‘zombified’ the economy, which has resulted in stagnated productivity growth. This implies that many corporations will not be able to continue operating when economy falters and/or rates rise. The foundations of the economy have been compromised. The asset market has become the economy. When the US housing bubble collapsed with catastrophic consequences in 2006-2008, the massive stimulus enacted by central banks was aimed at reinvigorating the global debt cycle, which has fluctuated through the different regions of the world since the 1970’s. They succeeded, but have now exhausted the current set of “solutions”. There are no more bubbles to inflate, except the real economy itself. Central bankers thus have only one “bullet” left: direct debt monetization. Whether done through the MMT fallacy or more traditionally, it would be the last gasp of failed central bank-run model of economic governance. If enacted, it would eventually destroy not just the purchasing power of money, but the corporate sector and the trust of citizens in the system. This is the lesson of history. It’s truly the ‘Horseman of the Apocalypse’. It is unknown at this point whether this last, desperate roll of the dice will be made. Still, we need to be prepared for the worst, because such policies are just a small step away from the current QE-programs. The Horseman is in the horizon.